Lauren Brooks Fitness: What the heck is MELT METHOD? How it changed my life! What the heck is MELT METHOD? How it changed my life! I recently discovered a simple self treatment system that anyone can do called "MELT Method". I must admit, I was very skeptical at first. What can little balls that you use to roll on your hands and feet actually do for your body? Some of the benefits I read about were better sleep, release back pain, release neck pain, lower stress levels, increase metabolism, easier breathing, improved grip, improve flexibility, help with migraines. The list went on! I still chose not to try the system. As a kettlebell fitness coach I work with an array of clients that are all ages, shapes and sizes. Some of my clients would come in from their stressful work week with neck pain, migraines, lower back aches from sitting too much at the computer or driving long distances and just a ton of tension all over their body. Many of them do yoga too. It would bother me that I didn't have anything for them to do at home other than the normal mobility protocol, continue to move throughout the day and show up to your sessions. I was getting very frustrated about this. I was also on a quest to figure out why my wrists continued to feel stiff and achey. I did gentle massage and a ton of mobility exercises especially focusing on my wrists daily. I thought maybe it was from doing push ups or pull ups. So I would take some time off and the wrist stiffness would still be there. I began looking in to neuromuscular therapy. This is when MELT came back on to the grid. I finally decided to give MELT a try. I started implementing the MELT hand and foot treatments several times a week. I began with the mini treatments and then worked my way to the soft ball treatments. I noticed in just a few treatments that I wasn't waking up with soreness in my wrists. In fact the pain and stiffness was COMPLETELY GONE! That's it, I was hooked! I almost couldn't believe it. This sh%t straight up WORKS! I knew I needed to learn everything about this and understand the WHY and the HOW. I still couldn't grasp why this worked so well. I felt how the treatment would work my connective tissue by gently hydrating it with the compression techniques, then when I would rinse and apply friction I felt the tingling sensation of the water and blood circulating throughout my body. Not just my hands feet! It was time to learn directly from the creator! I took a leap and signed up for a certification. When I signed up for the certification, you had to read a ton of material, take tests and write about it. It was my kind of certification. One that tested how well you understand and teach, not just how tough you are! I loved that you needed to do your homework and understand the science before showing up as well. When I arrived at the 3 day course, the founder of MELT, Sue Hitzmann, taught the "geeky" science behind this entire system in the most beautiful, funny, digestible manner possible. It truly created an experience that was mind blowing. It was everything I hoped for and more. All of the anatomy I took in college was a joke compared to this course. I UNDERSTOOD IT! It made sense! Since receiving my Hand and Foot certification, I've jumped head first into using this method with my clients. In just the very FIRST MELT Hand and Foot Intro Class, here are changes that happened during our assessments. - Felt lighter on our feet. This is just from ONE small hand and foot treatment while learning how to use the method. Do this several times a week and it becomes life changing! I'm pretty excited about this stuff as you may be able to tell. 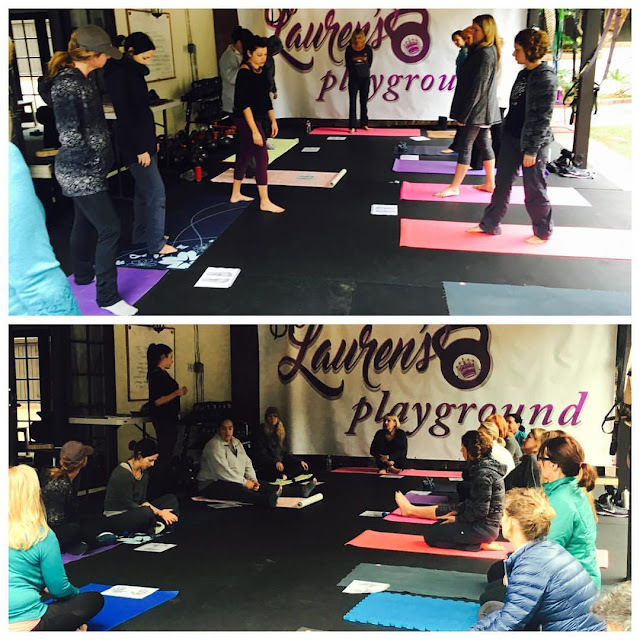 So excited, that I opened up 8 spots to teach this via Skype exclusively for members in Lauren's Playground. With the session I sent them each a MELT soft ball, since that's all you really need to get started. The spots filled up immediately! I will be opening up more spots soon. Please email me to be the first on the list. In the meantime if you don't want to wait, you can order the entire kit with the DVD directly from the MELT Method store and start sooner than later. She also has a great book that will teach you the science behind it. If you learn better in person I offer privates or group class settings in the San Diego area. I also offer private lessons via Skype or Facetime if you want to wait until I have more spots available. New date will be announced soon in San Diego (Encinitas) 75 minute workshop. The Boring Unsexy Training That Works!